Is This a Great Play? I was watching the top-80 plays of the week (or whatever arbitrary number they choose) last night on MLB Network, and this catch by Jason Kubel was #11. MLB Network tells me it’s a great play, and they and ESPN and all the other “they”s have been telling me that similar catches have been telling me that similar catches are “great plays” ever since my first cable TV subscription. But really, is it great? 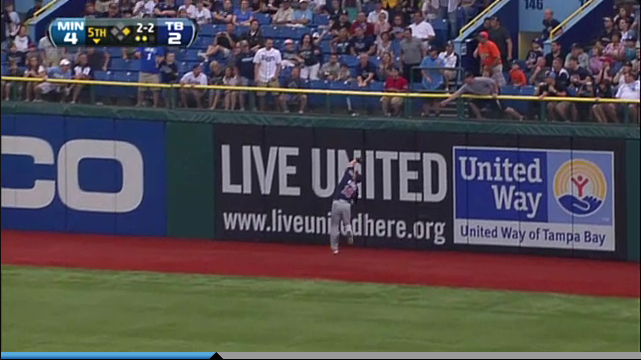 How many other right fielders make that catch? Is it only a great play because Jason Kubel is so bad at outfielding that it take the utmost of his defensive effort in order to make a play that could be stressful but not entirely difficult for the average fielder? Of course, maybe that is precisely what makes it a great play: it took anything and everything in Kubel’s defensive arsenal to make that play, and for that reason, we should be impressed. Perhaps I’m thinking too much like a UZR calculator, thinking that it’s not impressive if the average fielder makes that play 69.2735329% of the time. Maybe. I’m not sure. Although what I am sure is that this precise dilemma is why we as a community have such a tremendously difficult time evaluating defensive players, even those that we watch every day with our own eyes. But I digress. What do you guys think? Is it a great play? We hoped you liked reading Is This a Great Play? by Jack Moore! The route he took was horrendous, so my vote is no.